Successful Mobile App is not built by accident. Plan it with an Award Winning team which knows this game. So finally you have begun your quest of finding the best Mobile App Development Company for your Startup or business process. So how do you define the best? Someone who understands you, the one which can work with a given time and budget and yet deliver value, right? We believe that every app idea needs a technology partner who not just understands coding and development but also understands the underlying restrictions that almost every Startup has. All startups have a limited time, budget and yet need a quality benchmarked app. We take that challenge. At HestaBit Technologies, our experience with startups has conditioned us in a way which helps us build successful product strategies along with successful mobile apps. So how do we create a successful Mobile App strategy for a Startup? Well, first we need to make sure that we have defined the USP of the app very clearly. We define the one big problem that the Mobile App is going to solve. Once that is clear, then based on the time and the budge that the Startup has planned for the product, we discuss the functionalities that can be accommodated. We discuss what is absolutely necessary and what can be compromised for a quick launch. This makes sure that the core idea of the product is absolutely there in the App and it still gets built up in within a stipulated cost and time. How do we actually build Mobile Apps? HestaBit Technologies has a dedicated team of experts that work on Native Android, iOS, and Hybrid platforms. All these professionals are hired after 6 rounds of the interview where they are judged on their technical skills as well as business understanding. They are even given a special induction for our “Startup Agile methodologies”. We ensure that everyone from the project manager, Graphic designers to app developers understand the kind of gap we are trying to bridge when we say “We are startup focussed”. Technologies that we use for launching disruptive startups. We are really strong on the business consultancy to startups and these startups love when we discuss the kind of technology we use for their products. We use Technology which is cutting-edge, future-proof and real-time. Our team has extensive development experience in Android App development. We go well beyond what you see on the screen of your Android device. Our team has specialists in the field of XMPP chat servers, RTSP (Streaming Protocols), LDAP, Microsoft Active Sync, Asterisk, VOIP, OpenSips, Wowza etc. Our Apps have won Special mentions in Cannes’ Festival of Creativity and has won a number of prestigious awards. It’s really important to keep the iOS design standards in mind while designing an iOS application. We have a special place in our heart for iOS applications ( Read Apple ) and it can be clearly seen in our products. 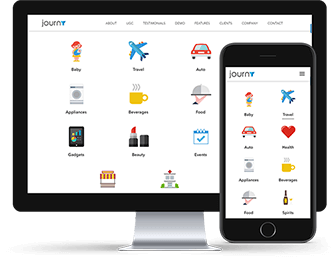 We tend to use native designs and native controllers which not only keep turnaround time faster but also make the App robust and future-proof. While Native apps are best when you have a “certain” budget and time with you; Hybrid apps are 99% times the best choice if you are launching your first app. It has a faster go to market, faster development, fewer dependencies and half the cost of native apps. We use React Native to build Hybrid apps. It helps us to run almost the same codebase on all the platforms, be it web or mobile. Here are a few Success Stories about why Startups that work with us have millions of downloads, are funded and are so successful. 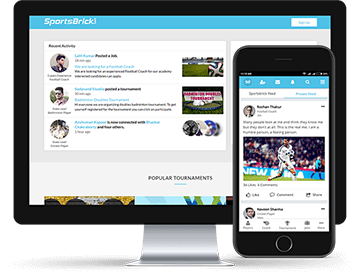 Social Network for Sports Professionals. Global Startups have global teams. Who knew that Google would find his CEO in India? It’s time we begin, isn’t it?